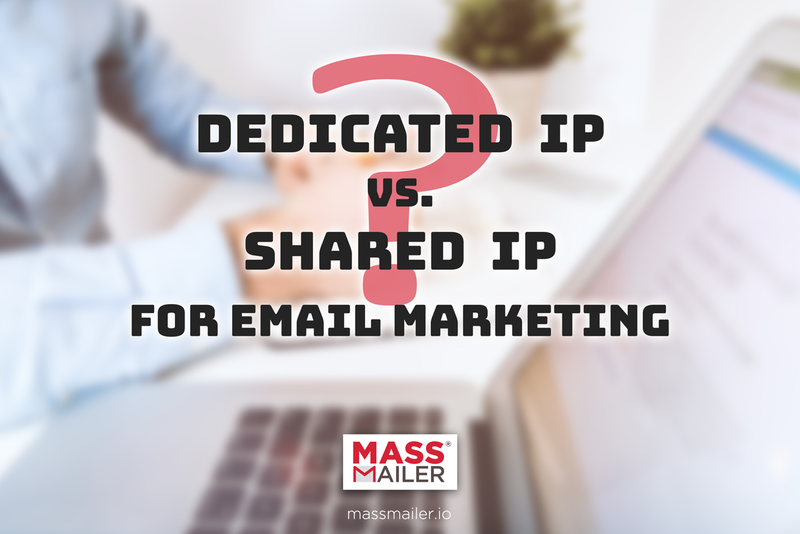 When you’re starting an email marketing campaign, you often need to choose between using a dedicated or shared IP address. A dedicated IP address is going to send only your organization’s data, whereas a shared IP address is going to send data from multiple companies. For businesses just getting started, a shared IP address may be sufficient but for most enterprises, a dedicated IP is preferred. Sharing reputation among startups. It can take some time to develop a reputation as an email sender. With a shared IP address, you’re able to build upon the shared history of multiple companies. This lets you hit the ground running rather than having to spend some time establishing your own identity. Saving money on an IP address. Because you’re sharing a single IP address, a shared IP address generally isn’t as expensive. This includes not only the IP address but also the shared email server resources. Maintaining a consistent amount of activity. A shared IP address will be consistently emailing large volumes of email, which means a sudden spike in your own activity isn’t going to lead to you being blacklisted. Avoiding punishment for any personal mistakes. If you do make some mistakes early on in your email campaign, you are not likely to experience any negative impact because you already have an established, shared reputation. On the other hand, mistakes on a dedicated IP address will be comparatively more serious, and will consequently lead to punishment. Having your own reputation. If your company email reputation is actually quite high, you don’t want it adversely impacted by other users sharing your server. By having a dedicated IP address, your email marketing campaign will let your business grow its own reputation. Originating from your own email address. A dedicated IP address is going to send information from your own IP address, whereas a shared IP address will display the information of the bulk Salesforce CRM email solution providers. This may not look as professional as desired, especially for larger enterprises. Using an IP solely for your own traffic. As mentioned, traffic spikes can lead to being blacklisted. But what if a different user on your shared IP address suddenly has a spike in traffic — and a spike in email denials? Once email denials occur, this could lead to your own emails being bounced. Avoiding punishment for other company’s mistakes. Presumably, an organization interested in email marketing for Salesforce should already be aware of how to sidestep potential issues. A company that has knowledge regarding the rules of email marketing will want to avoid punishment for the mistakes of other businesses, rather than avoiding punishment for their own. MassMailer offers both shared IP addresses and dedicated IP addresses for email marketing campaigns. Campaigns in Salesforce can use either. When starting to send bulk email from Salesforce CRM, you can begin with a shared IP address but moving towards a dedicated IP is usually preferred in any situation.